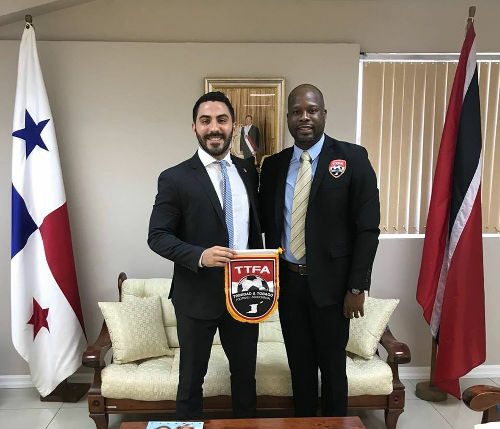 “As it pertains to the latter part of Item 2 [in the TTFA release] that refers to a member of the Technical Staff [who] reached out to the Ministry without the consent and knowledge of the TTFA Secretariat, please be informed that I had a conversation with the General Secretary that spoke to seeking assistance to the Ministry of Sport. 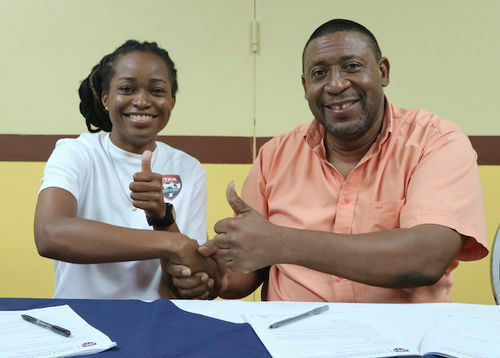 Today, Monday 17 September 2018, the TTFA sent out a media release which is completely misleading and I have no choice but to respond and defend myself against this attempt to sully my reputation and how hard I’ve worked for this Team and moreover Women’s Football. I am well aware that this release may jeopardise my position as Team Manager of the Women’s Senior Team, but I must stand up for some measure of principle and my own values. [That] email is copied below press release… TO DATE NO ONE HAS RESPONDED TO THAT EMAIL. In Item 2, the release speaks to the economic climate and not approaching Government for assistance and that they are seeking alternate funding. Please note, that no information was forthcoming. 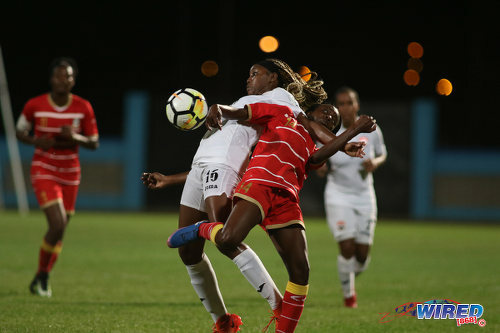 Photo: Trinidad and Tobago winger Kedie Johnson (left) tries to hold off St Kitts and Nevis midfielder Iyania Bailey-Williams during 2019 World Cup qualifying action at the Ato Boldon Stadium on 25 May 2018. Our team arrived in Jamaica in fragments with three foreign based players arriving on 20th August, 13 persons arriving on 22nd August (6 players and 6 staff), two persons arriving on a separate flight (one player/ one staff), five players arriving in early afternoon on Friday 24th and two players arriving 4am on the day of the first game (25th August) and two players arriving after our first game. Mainly because tickets were purchased late. Am I expected to watch this happen again and do nothing; not try to get assistance for the team? As it pertains to the latter part of Item 2 that refers to a member of the Technical Staff reached out to the Ministry without the consent and knowledge of the TTFA Secretariat, please be informed that I had a conversation with the General Secretary that spoke to seeking assistance to the Ministry of Sport. He informed me that it is the end of financial year and it won’t be possible to get any support due to the timelines when all financials had to be submitted. I insisted that we cannot sit there and not try to find funding; to which he responded that I CAN GO AHEAD AND REACH OUT TO THE MINISTRY TO SEE WHAT IS POSSIBLE. I made a call to the Ministry, I explained that we needed to get the team together and hence the email was sent to get a gauge of if and how much support can be received for the team. The email in effect was not an official request but it was the basis used to give the particulars and try to ascertain whether or not funding could be received from the Ministry. Item 3 refers to preparation and that the team played 19 international matches in 18 months. Out of these 19 matches, four were actual friendlies—two matches against Venezuela and two matches against Panama that were played one year apart in March 2017 and March 2018. The other Tournaments were all part of the calendar of events for Women’s Football in the region, i.e. 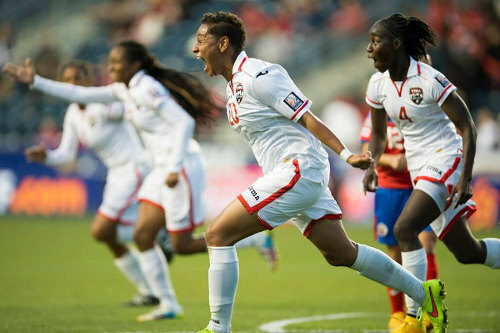 all other Women’s Teams in the Caribbean were participating in these same Tournaments—with the exception of CAC Games, where only Trinidad and Tobago, Jamaica and Haiti were from the Caribbean. 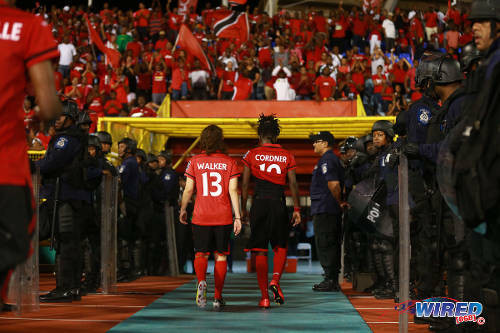 The other Caribbean Tournaments were CFU Challenge Series, CONCACAF Caribbean Preliminary (no longer called CFU), the CAC Games—where the TTOC covered the majority of expenses—and the recently concluded CONCACAF Caribbean Finals. At the end of the release, it shows a break down of the different costs paid to the Women’s Programme. Please note that the 2017-2018 calendar year is the year for Women’s Football major Tournaments. This shows the chauvinistic and misogynistic attitude towards Women’s Football. Are there any break downs of how much the Men’s Teams receive? Are we not supposed to receive funding to allow us to be successful? 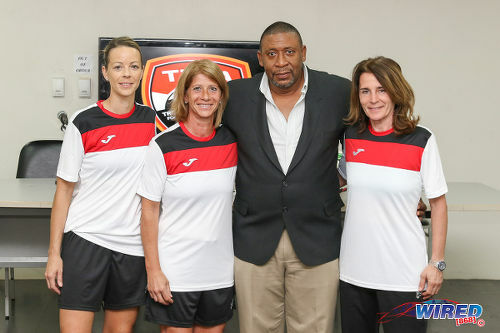 Trinidad and Tobago used to boast of having the top Women’s Football Programme in the region. It’s now been two cycles that our U-17 Team has not qualified for the CONCACAF Women’s U17 Tournament. While I will still give the current administration a measure of praise for the investment thus far to the Women’s Programme; is it that because you are paying our salaries and give a measure of support that we must just sit there and do nothing and accept whatever? The point of getting players on retainer contracts was to allow them to focus full time on football with the intention of qualifying for a World Cup. World Cup Qualifiers are here and to date, no news about getting the squad together to prepare for the Tournament, WE ARE NOW 17 DAYS AWAY FROM OUR FIRST MATCH. Are players and Staff just supposed to step lightly and not enquire about their salaries when it is late? Are the players not supposed to get frustrated and have a voice as they realise nothing is being done to help the Team? In closing, anyone who knows me knows that I have gone above and beyond for this team, many times using my own money to ensure that players can either get something to eat after practice or get home in some instances. Emails sent in the wee hours of the morning; but the way this matter is being handled by the Governing Body of National Football is uncalled for and lacks tact. It could have been addressed in a more professional manner, but c’est la vie!!! I am writing a bit frustrated as we are a mere 24 days from our first game in the CONCACAF Women’s Championship and we do not know who is the head coach to take the team forward; How can we plan without this information? 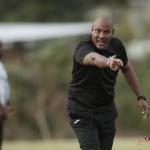 We returned from the CONCACAF Caribbean Finals a week ago to the exact day and we just decided that we needed to resume training, due to the fact that we cannot allow the players to remain dormant and inactive given the group that we have been placed. While the majority of persons may have already given up on us and not expect us to advance out of the group; we, the players and staff feel that we can be successful, but we need your support. 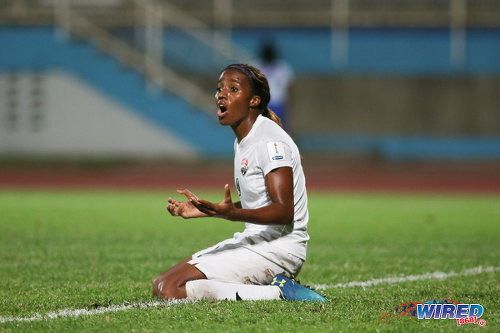 Photo: Trinidad and Tobago forward Mariah Shade reacts to a missed opportunity during 2019 World Cup qualifying action against St Kitts and Nevis at the Ato Boldon Stadium on 25 May 2018. SALARIES (PLAYERS AND STAFF)- The players received half of their pay for July, the staff hasn’t been paid for 2 months. Everyone has bills and responsibilities; in fact one of the players’ mom had a mild heart attack over the weekend and she is the main source of support for her family; another player has been borrowing money to pay rent. When can we expect to receive some kind of payment? This helps the overall morale and attitude of the team spirit. US VISAS- I have not received any further advise as it pertains to payment for visas; however, I would like to ask that once the players can pay for the visa applications that they are reimbursed once the funds become available to do so. ADDITIONAL STAFF- We would like to ask for additional staff in the areas of physical trainer, coach and physio. The physical trainer to assist with training, warm ups. Assistant Coach- Dernelle has been working as an Assistant Coach for the past year and having her in the Tournament environment as a coach can only augur well in her overall development as a Coach to prepare from the Training field to the Tournament. Physio- Jo-Ellen needs assistance in this area; we have many injured players and sometimes she is unable to service them as needed. Another physio can bring this support particularly with the concentration of overnight rehabilitation and getting players ready for the next match within 1-2 days. TEAM CAMP IN THE US- At this time, it doesn’t make sense to pay double airfare for the foreign based players to come here and then return to the US and then pay another fare from the Tournament to their respective destination. It is in this regard, I would like to request a Team Camp that would allow the full team to come together before the Tournament. Possible dates 25 September- 2 October 2018. We can seek to get practice games with several credible college women’s football teams around the area. Additionally, Costa Rica is also interested in getting 2 matches around these dates. – We can look at setting up in Raleigh, Durham which is 17 minutes from Cary, NC. I am currently working on accommodation, meals and transport costs. We do not have to eat at the hotel; I am sure we can get good meal rates from restaurants close by. I will submit a complete budget as soon as I get the costs; but again I do not have a head coach, so I am just going from experience working with previous teams. SEEKING ASSISTANCE AND FUNDRAISERS- We know that the TTFA is strapped for cash, not knowing when monies will come in, but we would like to try to assist by reaching out to companies and government agencies to seek assistance. Seeking assistance from other entities is not to embarrass the TTFA, but the TTFA cannot do it alone if we are to be successful. 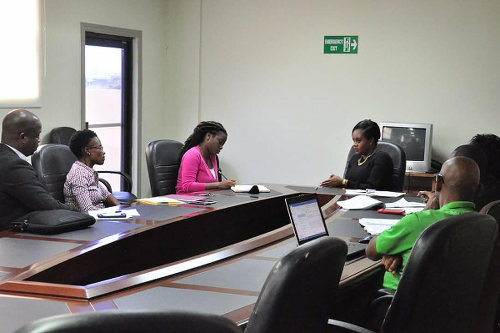 It is in this regard, we would like to seek permission to reach out to Private Companies and Government agencies to assist with the Team’s preparation and also we [are] willing to host fund raising ventures to help ourselves. Please advise accordingly as per the above. “It is poor managerial practise to engage in any matters that may arise internally to engage in those matters publicly. My training, experience and previous employers would attest to that. it is not good practice. 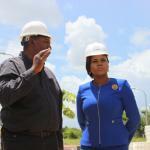 Editor Note’s: Click HERE for initial TTFA statement; and HERE for full response by Latapy-George.